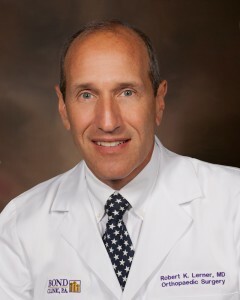 Robert K. Lerner, MD, FAAOS - Bond Clinic, P.A. Bond Clinic, P.A. Robert Lerner, MD is board certified in Orthopedic Surgery and a Fellow of the American Academy of Orthopaedic Surgeons. Dr. Lerner joined Bond Clinic in 1986. Dr. Lerner also holds office hours at our Lake Wales Office (by appointment only.) For more information or to schedule an appointment, please contact the Lake Wales Office at 863-679-1552. Lake Wales Office: 1342 State Road 60 E, Lake Wales, FL 33853.